Mark di Suvero’s sculpture “Sunflowers for Vincent” is the latest public art added to UMass-Boston’s Arts on the Point collection. The 7-ton piece was installed on the Columbia point campus on December 15. Dorchester’s impressive collection of public art recently got even more impressive. A bright yellow assemblage of reclaimed steel and aluminum, 30 feet long and 10 feet tall, was erected late last year on Columbia Point. Thus UMass Boston added its second major sculpture by internationally acclaimed artist Mark di Suvero to Arts on the Point, the university’s public arts initiative. One of the largest and most important collections of modern sculpture at any American university, Arts on the Point also boasts pieces by such modern art luminaries as Dennis Oppenheim, Roy Lichtenstein, William Tucker, Luis Jiménez, and Willem de Kooning. This latest acquisition, which weighs seven tons, was installed on December 15, between University Drive and the HarborWalk near the bend at the campus’s entrance from Morrissey Boulevard. 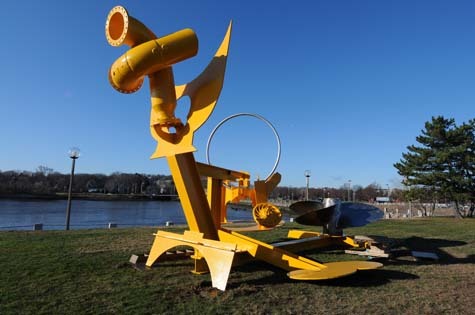 Titled “Sunflowers for Vincent,” the eye-catching interactive sculpture is di Suvero’s homage to one of his favorite artists, Vincent van Gogh, whose paintings of sunflowers are some of the Dutchman’s most famous. While working in construction as a young man, di Suvero was severely injured in a freight elevator accident. During his rehabilitation, he learned to use an arc welder and from then on focused all his attention on sculpture, often repurposing “junk” metal. Now his works are in prestigious museums and collections in more than half the US states as well as in Australia, France, Germany, Sweden, and the United Kingdom. “But Columbia Point is the only place in New England that you can see two monumental works by Mark di Suvero,” observes Paul Tucker, professor of art and curator of the campus’s Arts on the Point. Though currently placed as the first or last object one sees on the campus, “Huru” will likely be moved to a different location as UMass continues to reconfigure itself. Before transfer to Columbia Point, “Sunflowers for Vincent” was displayed for many years in the deCordova Sculpture Park in Lincoln, MA.